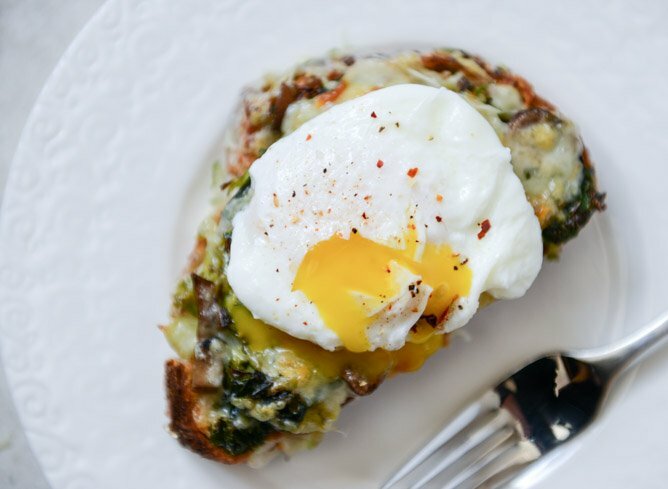 Broiled Fontina Toasts with Roasted Garlic and Poached Eggs. If you love yourself, you’ll put some eggs on your Valentine’s Day. It may not be sprinkles, but it’s just as good. Swear. I know, I know. I’m all about eggs and toast and sandwiches and things like that lately, and it’s true – I can’t get enough. It’s my comfort food and hello – there is like a million inches of snow outside. Or three. Three inches. It feels like a million though since it’s been snowing for two months straight. I was certain that this warm brussels caesar would be my last sprouts recipe of the season. I mean, my overzealous use of the sprout is reaching a point that is considered obnoxious and insane. Maybe it’s because they’re just so good and I STILL can’t believe how much I love them? The good news is that this isn’t alllll brussels sprouts. The bad news is that there is no bad news. This is like a massive flavor explosion in your mouth. Yeah I said it. About two weeks ago, I remembered that I made these mushroom melts with aioli and decided it had to be my lunch every day. With my food boredom at a current all-time high, the mushroom melts morphed into what-else-is-in-my-fridge melts. And then I remembered that I had made these gruyere and brussels toasts over the holidays for dinner one night and that was the end of only mushroom toasts. Never again. Also, in true Jessica fashion I ended up getting lazy (read: starving) and decided that I couldn’t be bothered to whip up the Dijon aioli. But! I COULD be bothered to use the leftover roasted garlic in my fridge. And then I ate this three days in a row. Even though avocados are in the saddest state ever right now, my toast game doesn’t decrease. Avocado toast will always be my number one but this has opened up a whole new world for me because it’s pretty filling. And the roasted garlic? GAH. I sound like a total idiot every time I talk about roasted garlic because it’s almost as if I forget just how much I love it… every single time. Those caramel, buttery cloves constantly blow my taste buds away. AND there is all this golden, slightly-burnt (the best kind) bubbly cheese. And an egg. An egg! As if that’s not reason enough. Heat a large skillet over medium heat and add olive oil. Add the shallot, brussels, mushrooms and kale and toss. Cook, stirring occasionally, until the vegetables begin to soften, about 6 minutes. Stir in the salt and pepper, tossing well, and turn off the heat. At this point, you can also begin to cook your eggs as desired (I use this poaching method) so everything is ready at once. Preheat the broiler in your over to high heat, making sure an oven rack is directly underneath. Spread each toast with a layer of the roasted garlic. Add the vegetables evenly on top, then sprinkle all the toasts with the grated fontina. Place them on a baking sheet and broil until the cheese is melty and golden, about 1-2 minutes. Keep an eye on it the entire time to ensure that it doesn’t burn. 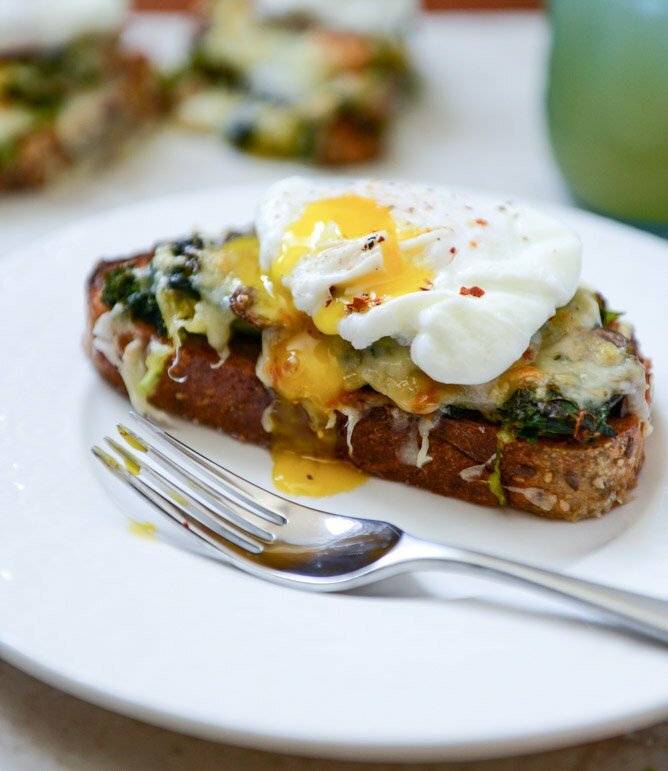 Remove the toasts from the oven and immediately top with the egg and a sprinkle of crushed red pepper. Serve! Okay. I promise. I’m done with the toast and the eggs for now. Well, maybe just the toast. I think. Kind of. 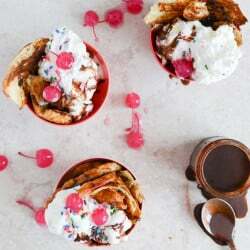 Crispy Croissant Sundaes with Red Wine Hot Fudge. This is all I want for valentine’s day! You had me hooked at the first sighting of that gorgeous dippy egg. This looks amazing!! And don’t you worry – feel free to keep those eggs on toast recipes coming because I’m going through a similar phase right now! I’ve been loving on some eggs recently…eating them for lunch. I love drippy eggs too. This recipe is PERFECT for V day! Yes. This is my love language! Everything about this is amazing, however most amazing is the fact that the recipe calls for 2 whole bulbs of roasted garlic <3. I think I will make this as a test to see if my man will still kiss me after eating it because THAT is true love ;) you are so fabulous! I want this NOW! Happy Valentine’s Day! You are right! You are SO totally right. Excuse me while I go get some eggs a’poaching. O.M.G. This looks SO freaking good, I think my mouth is watering. I love runny eggs!!!! I need to learn your egg poaching skills.. i find it very hard. LOVE these ingredients — especially that roasted garlic! Looks delish! That egg. Ohhhh, that egg! Eggs are so misunderstood. You have given them a new life on something so irresistible! I am seriously so excited about your cookbook! Maybe too excited?? I had a dream last night that you were my hairdresser, and that you were secretly married to jay-z. I can’t even say if you were a good hairdresser or not because I was so blown away by your secret husband. this is the most amazing thing i’ve ever read. day = made. Look delicious! Trying these ASAP! Best Valentine’s Day lunch ever! You keep me craving eggs! Thanks! I love all these brussels sprouts recipes! Keep them coming! This looks fantastic! I must love myself a whole lot because I put eggs on every day. Oohh these look good!!! Happy Valentine’s Day! i swear, i’d be happy for the rest of my life if i could just have toast and eggs every single day. Something about the crunch of the toast and the soft egg, mmmmmmm! See, this is my kind of holiday breakfast. BEautiful runny egg yolk for all! i’ve been totally nutso over poached eggs lately! This looks incredible. I am in love with your love for Brussels. I cannot get enough of them so thanks for sharing this. Gah, drool central over here. Keep doing the eggs and toast!! It’s the only thing my pregnant belly is happy with right now. This (or some variation of it) is my go to quick lunch. You do realize you make the most gorgeous eggs, don’t you? Sweet goodness, I would eat up the whole baking tray of these straight from the oven! These toasts look fabulous! This is right up my alley! Perfect for breakfast, lunch or dinner! Okay, I’m going to confess. I have never, ever had a poached egg, never. I used to love soft boiled eggs as a kid but as I grew up I got more and more freaked out by runny eggs, the texture just didn’t sit right with me. I also hate jello. I just can’t dig slimy. As such, I’m a strictly scrambled, hard boiled or omelet kind of girl. Maybe I need to be brave and destroy my irrational dislike of poached eggs. I’m just about to go out to dinner and now you’ve made me want this instead! Breakfast tomorrow perhaps… I wonder if I put this photo under my darling’s face he will get the message? this is definitely on the list to try – my fav breakfast is corned beef hash and poached eggs. Think this would work well with it. BTW, love, love Fontina. It’s my fav pizza cheese! These look amazing! I am sadly allergic to avocados (seriously, it’s the worst), so no avocado toast for me… but this sounds incredible! Your posts make me sad about the lunches that I’ve eaten. OMG please come poach me some eggs. You’ve taught me to do it so at least they aren’t ruined before I can eat them, but they never turn out looking as delicious as yours! Every time I go home my Dad offers to make me 12 different delicious things, but 90% of the time I end up asking him to make me poached eggs! Sooo yummy. This could not be more up my alley! Your are a freaking genious! I love the indulgence and decandence of this toast. You have assembled a whole group of ingredients I love in such a brilliant way! All I’m sad about is that I was never able to find fontina cheese where I live. Maybe one day, right?